Move over, Charlie Brown. Boston is so full of Christmas spirit that your sad little tree just won't do. We take the holidays seriously and decorate our houses, parks, and government buildings with cheerful purpose. Every year for the past 46 years, the Canadian province of Nova Scotia has gifted a beautiful Christmas tree to the city of Boston to display on the Boston Common. A special bond between Boston and Nova Scotia was born out of tragedy when the Norwegian SS Imo had an accidental collision with the French SS Mont-Blanc in the Halifax Harbor on the morning of December 6, 1917. The SS Mont-Blanc was carrying picric acid, TNT, and guncotton. A fire on board spread to the ship's cargo resulting in the largest man-made explosion prior to the development of nuclear weapons. The blast leveled everything within a half-mile radius, killing an estimated 2,000 people and injuring another 9,000. Boston was the first to respond and quickly dispatched a train containing food, water, medical supplies, and medical staff to help in the relief effort. Come see Nova Scotia's gorgeous gift and all of the planted trees on the common decorated and lit up in all their Christmas glory. You've never experienced a light and sound show quite like Blink! From November 28, 2018 through January 1, 2019, the open Faneuil Hall Marketplace is transformed into a winter wonderland. Gather around the tallest decorated Christmas tree in the northeast and watch as more than 350,000 LED lights and strobes light up in synchronicity with your favorite Christmas songs. There are five 20-minute shows between 4:30 and 10pm each and every night. Come for Blink! and do some holiday shopping while you're here. Visit the local artisans at Faneuil Hall for charming handmade goods or check out all of the major brands with stores in the neighborhood. The Back Bay neighborhood of Boston is often touted as one of the greatest examples of urban planning in the country. In the early 1800s, an expansive filling project began to turn the coastal wetlands into buildable land. In 1856, Arthur Gillman was charged with designing the beautiful neighborhood you know today. His plans included laying out the new streets in a grid pattern, with Commonwealth Avenue being its central axis. When designing Commonwealth Avenue, Gillman was largely inspired by the grand boulevards of Paris. The street was deliberately designed to be long, straight, and wide, with a beautiful mall of trees and sculptures running up the center. At Christmastime, the Boston Parks and Recreation Department decorates the trees lining the mall with thousands of elegant white lights in what is one of the most beautiful displays in the city. Take a stroll down this gorgeous boulevard and see why Winston Churchill declared that Commonwealth Avenue was “the grandest boulevard in North America” during a trip to Boston. Named after John Singleton Copley, the most influential painter in colonial America, Copley Square is a public square in the heart of Back Bay. It’s marked by carefully maintained gardens and gorgeous fountains and sculptures. Within the square are some of Boston's most important landmarks, including Old South Church, Trinity Church, and the Boston Public Library. When Copley Square was first built, it was known as Art Square and served as the hub of Boston's most important institutions. The Museum of Fine Arts, MIT, Harvard Medical School, New England Museum of Natural History, the American Academy of Arts and Sciences, the Massachusetts Normal Art School, the Horace Mann School for the Deaf, Boston University, Emerson College, and Northeastern University were all located in the square before spreading across the growing city of Boston. Every year, a magnificent Christmas tree is decorated and lit in Copley Square to celebrate the holidays. 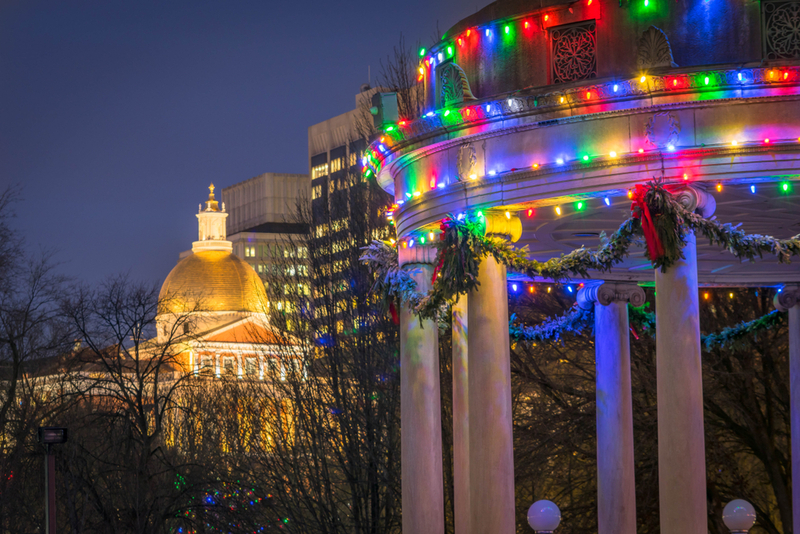 Visit this historic corner of Boston and enjoy some Christmas cheer while you're at it. Christopher Columbus Park is nestled on the waterfront in Boston's North End and offers stunning views of the Boston Harbor. During the summer, the greenspace is used for community events, including lawn games and Sunday night movies. At Christmastime, the park is transformed into a beautiful holiday display. The trees throughout the park are decorated with sparkling lights. The crown jewel is the park’s spectacular 260-foot trellis illuminated with more than 50,000 Christmas lights. When you've had enough of the cold, escape to one of our 42 wood-burning fireplace suites, each featuring a parlor with a wood-burning fireplace, with a dedicated Fireplace Butler and a seasonal firewood menu.